Green Goblin/Norman Osborn is a fictional character appearing in comic books published by Marvel Comics. The character was created by Stan Lee and Steve Ditko and first appeared in The Amazing Spider-Man #14. Ruthless industrialist Norman Osborn was the co-owner of a leading New York firm, Osborn Industries, which specialized in chemical manufacturing via Osborn Chemicals, as well as other areas of research and development, including robotics. His wife Emily died within a year after the birth of their son Harry, leaving Norman embittered. The product of an oppressively stern upbringing by an alcoholic father who lost the family fortune, Norman raised Harry dispassionately, often devoid of fatherly warmth, being chafed by Harry's failure to demonstrate academic excellence or a competitive drive. Despite living in reacquired opulence, Harry felt depressed and neglected by his father. Unbeknownst to Harry, Norman had risen in power by participating in a collusion enabling the creation of powerful opponents to challenge the super-hero community, thereby offering corrupt corporations a means to distract the heroes from probing into their affairs. One failure in this regard involved using Osborn Industries employee Nels Van Adder as a human test subject, transforming him into the disfigured "Protogoblin." Osborn dodged accusations of wrongdoing from his head of security, Arthur Stacy, and his brother Detective George Stacy. He discovered the notes of his business partner, Professor Mendel Stromm, for a strength-enhancing serum. Stromm was jailed after Norman had him arrested for embezzling funds, allowing Osborn to gain full control of the firm. Osborn tested the serum upon himself in his private lab, but the unstable concoction exploded in his face leaving him hospitalized for weeks. He emerged smarter and superhumanly strong, but at the cost of his sanity. (After Harry's death, Spider-Man discovered recordings in which Harry claimed to have been responsible for the serum exploding, bitter at being neglected by his father; however, Harry suffered mental instability at the time of these recollection; the veracity of this claim is unknown). Lusting for more power, Osborn plotted to organize a world-wide crime syndicate, targeting Spider-Man (Peter Parker) as a means to establish his reputation. He hired the fire-wielding Scorcher to steal secret plans for electronic equipment, explosives, and compact turbine engines, while using illicitly gained technology to create the axe-wielding villain, the Headsman. Incensed after the Scorcher and Headsman failed to kill Spider-Man, Osborn decided to take matters into his own hands. He designed a grotesque green costume based on an image from a childhood nightmare and the color of Stromm’s serum, and armed himself with high-tech weaponry and a broomstick-like glider, becoming the Green Goblin. Recalling Spider-Man’s earlier ambitions in show business, he lured Spider-Man to New Mexico to film a movie about his exploits, after contacting low-budget film producer B.J. Cosmos, in order to document Spider-Man’s defeat. Despite hiring the Enforcers for assistance, the Goblin ran afoul of the Hulk and his attempt on Spider-Man’s life was a failure. The Goblin next ambushed Spider-Man at a meeting of the Spider-Man Fan Club, where he clashed with the Human Torch. 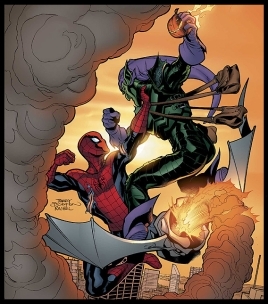 Failing again, the Green Goblin focused on assuming leadership of Lucky Lobo's gang, but Spider-Man's interference resulted in the gang's arrest. An uneasy alliance with Nick Lewis, the Crime-Master (whereupon Osborn tricked Lewis to believe the Goblin was J. Jonah Jameson) was also unsuccessful, and the two subsequently became rivals for control of New York's crime syndicates in opposition to the Maggia. 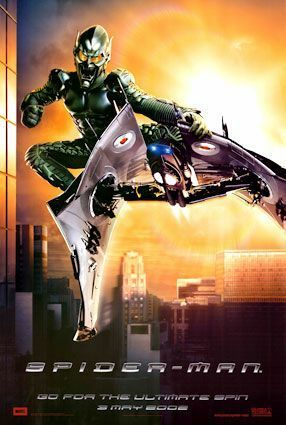 The Green Goblin captured Spider-Man in a power play to divert nomination of leadership of the independent mobsters to him. Spider-Man broke free and battled along side the police against the gangsters. The Goblin escaped, while the Crime Master was killed by the police in a gun battle. Osborn changed tactics, and laid low while hiring Kraven the Hunter to attack Spider-Man. Over time, Osborn established a network of safe houses to store his Goblin equipment throughout New York City. Unaware of the Goblin's secret identity, Spider-Man protected an ungrateful Norman Osborn from the vengeance of Professor Stromm, released from prison. Devising a compound that weakened Spider-Man's spider-sense enabled Norman, aloft on an improved glider, to follow Spider-Man and witness him resume his civilian identity as Peter Parker, one of Harry's classmates. The Goblin confronted Spider-Man at his home in Forest Hills, captured him, and carried him to the Goblin's waterfront hideout at Osborn Chemicals. There the Goblin boastfully revealed to Spider-Man of his own secret identity and how he came to be. Spider-Man broke free, and in the ensuing battle, the Goblin fell back into live wires and vials of chemicals, leaving Osborn unconscious and amnesiac regarding his past few years and his criminal alter-ego. Spider-Man decided Osborn was rendered an innocent man, and burned his costume before police and firefighters arrived on the scene. The world believed the Green Goblin had perished. Subsequently, Osborn’s insane mind developed a dual-personality disorder, as traumatic events triggered a switch between being a memory-impaired kinder Norman Osborn, concerned about his relationship with his son, and the nefarious Green Goblin, aware of Spider-Man's secret identity. After Harry invited Peter Parker to live with him, Norman met Peter again, unaware of his dual identity. Released from prison and seeking his payment for services to the Goblin, Kraven sought Osborn after learning of the Goblin's apparent death and believing him to be the Goblin's "emissary". Kraven abandoned his violent pursuit and capture of Osborn after realizing Osborn was truly unaware of the Goblin; Spider-Man had to rescue a bound Osborn from plummeting to his death. The amnesia proved to be only temporary however and Osborn relapsed into his Goblin persona twice more only to be defeated by Spider-Man each time. After helping rescue Peter Parker's girlfriend Gwen Stacy and her father, retired police captain George Stacy, from a kidnapping by the Kingpin, Osborn had a brief affair with Gwen which resulted in an unusually rapid pregnancy and secret birth of twins, Gabriel and Sarah. Though Gwen left the twins in the care of Osborn's people in France, Gwen refused to give Norman custody of the twins, fearing that the fate of Norman's son, Harry - mentally deteriorating and turning to illegal hallucinogenic drugs - would befall her own children. Osborn threatened Gwen, but she insisted that she would tell Peter the truth. Gwen believed Peter would marry her and raise the twins, trusting that Parker's love for her would oversee her failings. This prompted the third emergence of Norman's dark side, propelling what would be one of the darkest hours in Spider-Man's career. 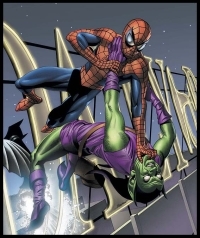 In a strike against both Gwen and Spider-Man, the Green Goblin kidnapped Gwen and took her to the top of the Brooklyn Bridge. In an act of brutality during a melee with Spider-Man, the Goblin threw Gwen from the bridge. Spider-Man attempted to save her but she had already died during the fall. Filled with rage, Spider-Man savagely attacked the Goblin nearly killing him. He returned to his senses at the last minute however, while the Goblin took the opportunity to attempt one final play by remotely controlling his damaged goblin glider to impale the wall crawler. Spider-Man was able to dodge the glider which instead impaled the Goblin, seemingly killing him. The nightmare was over...or at least that's what Peter thought. Harry Osborn, Norman's son, had witnessed the apparent death of his father at the hands of Spider-Man and removed the Goblin costume before the authorities could arrive, thus preserving his secret identity. He even bribed the coroner so that further autopsy reports would show no mention of the "goblin" formula in Norman's blood. And for many years, the world believed Norman Osborn to be dead. After the apparent death of the Green Goblin, many tried to follow in his footsteps, including his son Harry, Harry's therapist Bart Hamilton and millionaire Roderick Kingsley who attempted to create his own variation and legacy on the Goblin motif as the murderous Hobgoblin. Each subsequent version of the Goblin was defeated and Harry eventually died as a result of exposure to an untested experimental version of the formula that had given his father his abilities. Little did anyone know that Norman Osborn was in fact alive and well and putting a master plan into place that he hoped would ruin Spider-Man forever. The same formula that had given Osborn his heightened strength and intellect also gave him powerful regenerative abilities, allowing him to survive the impalement by his goblin glider. He had escaped the morgue, replacing his body with that of a drifter he had murdered (and impaled through the chest) and fled to Europe. There he joined the Cabal of Scriers, eventually moving up in their ranks and completely taking them over. While in Europe, Osborn also manipulated Gwen Stacy's children into believing that Peter Parker was their father and had abandoned them and that Spider-Man had killed Gwen. Osborn also raised them to believe he was a loving and kind figure, preparing them to become his heirs. After the death of his son Harry, whom Norman believed would prove himself in his absence, Osborn accelerated a series of plans he had formulated over the past several years. From the shadows, Osborn manipulated Empire State University professor Miles Warren as part of a grand scheme to have Parker believe he was in fact a clone and that Ben Reilly (the real clone) was the real Peter Parker. However, with Peter's wife Mary Jane pregnant and the possibility of a life without Spider-Man on the horizon, Peter freely relinquished his alter-ego to Reilly. Unsatisfied with these results, Osborn returned as the Green Goblin revealing himself as the mastermind behind the entire fiasco and killed Ben Reilly who sacrificed himself to save Peter. Reilly's body disintegrated, proving that Peter was in fact the real Spider-Man all along. In addition, Osborn had an employee of his, Alison Mongrain poison Mary Jane inducing a premature labor, and causing an apparent miscarriage. When it became evident that Osborn was finished using Mongrain, she fled for her life revealing to the Parkers that Peter's Aunt May, believed to have died, was alive and held against her will by Osborn. In truth, the May Parker living with the Parkers had been an actress Osborn genetically altered into the likeness of May Parker. Mongrain was killed, and the entirety of her role in the miscarriage remains a mystery. Osborn's next grand scheme was to make Spider-Man his heir, first drugging him into wearing the Goblin costume and attacking his friends. After days of physical and mental torture at the Osborn Estate, Peter nearly gave in, but refused at the last minute. Next, the Goblin forced his employee Flash Thompson, a recovering alcoholic, to drive a truck while in an inebriated state into Midtown High School where Peter had taken a job as a teacher. The accident caused Flash brain damage, and spurred Peter into a no-holds barred battle with his old enemy. Although, it seemed that in some strange way Norman wanted Peter to finish him off, Peter refused saying he did not want to fight him anymore and declared a truce. Sometime later, Norman Osborn was finally revealed to the public as the Green Goblin and after an climatic battle with Spider-Man and Luke Cage that raged across Manhattan, he was finally imprisoned. However, things were far from over. From behind bars, Osborn once again masterminded a plan against Spider-Man. This time he had Mac Gargan, also known as the Scorpion, kidnap Peter's Aunt May. The plan was for Spider-Man to break Osborn out of prison in exchange for his Aunt's life. Peter reluctantly agreed and with the help of the Black Cat proceeded to break Osborn out...only to have twelve of his greatest enemies waiting for him on the outside. Osborn had assembled a Sinister Twelve, which included Mac Gargan newly bonded with the Venom symbiote. However, Mary Jane had contacted S.H.I.E.L.D. and the villains were faced with the combined might of Captain America, Iron Man, Yellowjacket, Daredevil and the Fantastic Four. 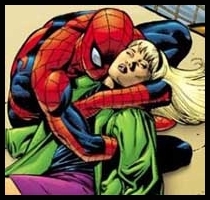 During the fracas, the Goblin had escaped to kidnap Mary Jane and took her to the George Washington Bridge in order to replay his murder of Gwen Stacy...a final act of vengeance against Spider-Man. However, a drugged Doctor Octopus intervened attacking the Goblin. Spider-Man was able to save Mary Jane after a bolt of lightning sent the two villains into the river. Osborn escsaped. Following some verbal clues from the Goblin, Peter was also able to discover where he had hidden Aunt May and rescued her as well. Peter then received a letter mailed by Osborn before the fight, thanking Peter for giving his life meaning and purpose. After Osborn was picked up by S.H.I.E.L.D. agents in France and returned to jail, the twins of Gwen Stacy resurfaced to destroy Spider-Man. They had rapidly aged to teenagers due their superhuman physiology inherited from their father, and had developed superhuman strength and endurance capable of combating Spider-Man. After the Goblin's takedown, the twins confronted Spider-Man, whom they believed to be their real father who had killed their mother and abandoned them. Spider-Man told the twins the truth - however Gabriel rejected Spider-Man, and accepted the Goblin mantle as the Gray Goblin, becoming insane in the process. After battling Spider-Man, a deranged Gabriel disappeared, while Sarah sought training to use her powers for good. The passage of the Superhuman Registration Act provided an opportunity for Osborn to offer his abilities for the good of the country. Injected with nanites by Tony Stark (Iron Man) capable of delivering a powerful shock should he go astray, Osborn was offered leadership of a new government sponsored Thunderbolts with a small army of superpowered evildoers as a temporary means to round up rogue heroes who refused to register. He would go from the Thunderbolts to leading his own team of Avengers, as the Iron Patriot, but the power went to his head. Feeling he was more important than even the President of the United States, Osborn led an unsanctioned siege on Asgard and was opposed by not only the Asgardians but every major unregistered hero he attempted to capture. He was exposed to the nation as a deranged criminal and was removed from power. Osborn was thrown into a classified prison called the Special Containment Center along with some of the most dangerous individuals on the planet. It was meant for him to rot there for the rest of his days, but a Goblin cult orchestrated a riot to free him. Osborn liberated others too and found new powerful allies: the South American chimera god, Ai Apaec, a demonic entity known as Kingmaker, the intangible killer "Carny" Rives, and a scientific genius wrapped up in the perfect form of the Toxic Doxie. During his escape, Osborn killed another inmate, Xirdal, an alien who accused him of being a psychotic murderer. Once back in the open, Osborn turned himself in just so he could be jailed at the Raft to await his day in court. Green Goblin usually works alone, but sometimes he works with various groups such as Order Of The Goblin, Goblin Gangs, Goblin Underground and War Goblins. Green Goblin being a villain has a number of enemies who are all superheroes. His enemies include Spider-Man, Spider-Man(Miles Morales), Daredevil, Agent Venom and many more. Spider-man was directed by Sam Raimi. It featured Tobey Maguire as Peter Parker/Spider-man, Kirsten Dunst as Mary Jane, James Franco as Harry Osborn and Willem Dafoe as Norman Osborn/Green Goblin. The movie was a huge hit and performed well both critically and financially. In The Amazing Spider-Man 2, Norman Osborn appeared to be dying of some disease. After he dies, his son Norman Osborn takes the role of the Green Goblin. Norman Osborn was portrayed by Chris Cooper. The movie performed well financially but received mixed reviews from the critics.